Thursday’s morning coffee is sponsored by IGRC Communications, in cooperation with United Methodist Communications. 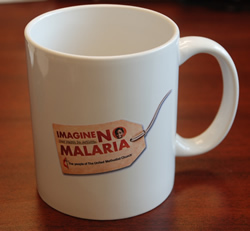 Stop by the coffee station and pick up your free Imagine No Malaria coffee mug (whether you drink coffee or not; limit one per attendee). These mugs can be purchased in quantity for $2 each postpaid and churches will be able to place orders during the month of June as a fundraising effort for Imagine No Malaria. Sell the mugs for $5 each and send the $3 profit to Imagine No Malaria. Online orders can be placed at: www.igrc.org/INMmugs or you may complete the paper order form located at the coffee station with the United Methodist ministries resource bag. IGRC Communications focuses and guides the communication ministry of the Illinois Great Rivers Conference. Its role includes both the publication and production of a monthly newspaper, The Current; the design, support and maintenance of the conference web site igrc.org; video and audio production and distribution and producing interpretative and communication materials that facilitate the vision and mission of the annual conference through collaboration with the ministry areas of the conference. The team also resources local churches with training, marketing and consulting services while leading the conference in using new and emerging technologies. The Communications Ministry Team provides a connectional relationship between the conference and United Methodist Communications. The Communications Team also is responsible for the United Media Resource Center (UMRC), a lending library with resources to support the various ministries of the IGRC. The Resource Center contains a variety of resources for pastors, Sunday School teachers, committee members, small groups, youth groups and children's ministries as well as resources for personal spiritual growth. There is no rental fee to borrow resources; the only cost to churches is mailing items back to the center. Visit and browse the UMRC collection at www.igrc.org/UMRC. United Methodist Communications, based in Nashville, Tenn., meets the communication, public relations, and marketing needs of the entire Church, reflecting the cultural and racial diversity within The United Methodist Church. UMCOM provides communication resources and services to local churches and annual conferences. UMCOM also has a consultative relationship with all general agencies of the Church and with any structure for communication and public relations at the jurisdictional, Episcopal area, annual conference, district, or local church level.